Today marks the 50th Anniversary of the March on Washington and Martin Luther King Jr.’s famous, “I Have a Dream” speech. 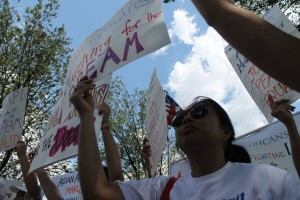 This past weekend, to commemorate this important occasion, Asian American organizations joined thousands of people who gathered in the nation’s capital to participate in a march and rally titled, “National Action to Realize the Dream March”.. The purpose of this march and rally was not just to remember the legacy of Dr. King and the progress since his speech over 50 years ago, but to show that even today in 2013, inequality persists. 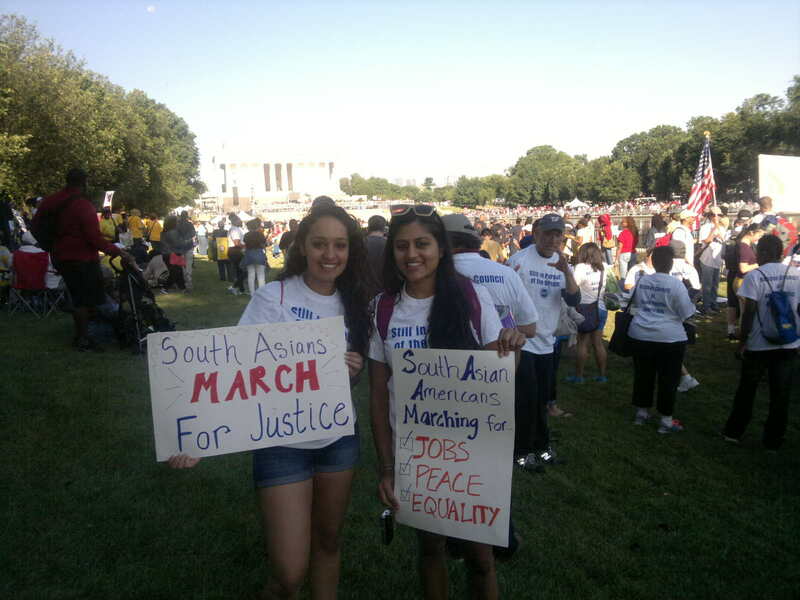 Among the Asian American organizations present at the March were representatives from SAALT, Sikh American Legal Defense and Education Fund (SALDEF) and Desis Rising Up and Moving (DRUM). And as part of the program on Saturday, Jasjit Singh, Executive Director of SALDEF spoke and shared the stage along with other civil rights leaders. 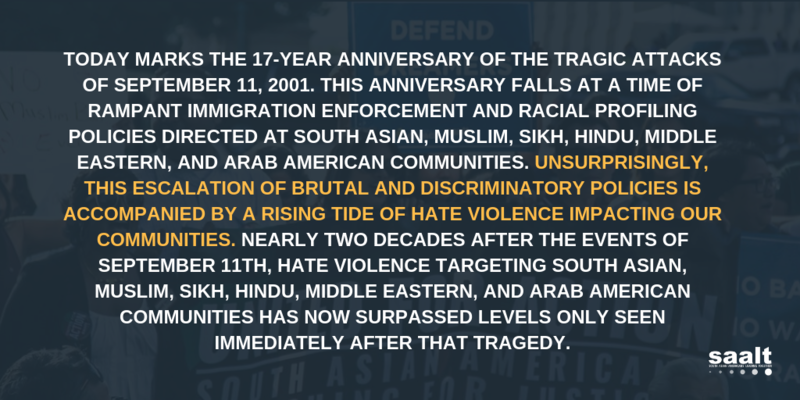 The work still continues, especially within the South Asian, Muslim and Sikh communities when it comes to decreasing hate crimes, discrimination, harassment and racial profiling following 9/11, and the tremendous disparities within South Asian communities from the standpoint of access to educational equity, jobs, and health care. We marched and rallied in solidarity for jobs, justice, peace and equality along with Americans of all races, faith and backgrounds. We showed that even though 50 years has passed since Dr. King’s speech calling for equality and justice we still have yet to pursue that dream. So today, on the actual date of the March on Washington, as we commemorate Dr. King, his legacy and the struggles that were endured to defend our civil rights, let us not forget that problems still persists and that we are still in pursuit of the “Dream”. Check out this article in the SF Gate about the struggles of non-profits in the Bay Area in these challenging economic times. Nonprofits are seeing an alarming drop in funding and increased demand for help this year, setting the stage for a complete shakeup of the sector in 2010. Unlike recessions past, this one could permanently alter the nonprofit landscape, say nonprofit CEOs, forcing possible closures and mergers as the sector restructures to survive. Hardest hit will be the Bay Area, home to one of the highest concentrations of nonprofits in the nation. There are 25,000 nonprofits in the region; 7,000 in San Francisco alone. Among them are 10,000 charitable nonprofits with budgets above $25,000. Their combined budgets account for 14 percent of the Bay Area’s gross national product – twice the national average. The article discusses the constant fears of non-profits around the country including bracing themselves for a significant drop in funding in 2010. Many non-profits feel comfortable with their budgets for 2009 because funding was acquired before the economic downturn – but 2010 proves to be quite a challenge. Funding from most sources is being cut – foundations are scaling back grant amounts, government agencies are revisiting funding priorities, corporations are facing their own budget cuts, and most individuals are feeling more hesitant to donate money instead of saving it for a “rainy day” that might occur at any moment. However, it is important to note that these are generalizations and that some entities are actually increasing funding because they recognize the increased need for non-profit services during this time. A need which does not necessarily correlate with an increase in funding. If you are interested in attending some workshops around fundraising during these tough times – register for the 2009 South Asian Summit to have access to those workshops and much more! Does the Stimulus Bill Impact South Asians? “Knowing and understanding the diversity of our communities, it’s hard to say what the final impact of the American Recovery and Reinvestment Act will have on South Asians across the country. Personally, I think there are enough stipulations in the bill that provide hope for our communities. For example, $1 billion will go towards the 2010 Census. Why does this matter? Well, the census provides the backbone of information that determines how a lot of public money and even private sector money is spent. Part of this $1 billion will be used to increase in-language partnerships and outreach efforts to minority communities and other “hard-to-reach” populations. 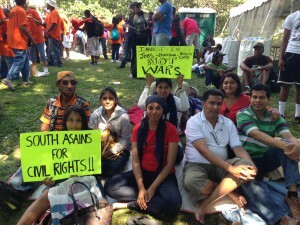 If more South Asians are counted in the 2010 Census, then there will likely be more resources for our communities. We do know that there are some provisions that will help low-to-moderate income individuals, and this will definitely help many South Asian families. For example, there is the Make Work Pay refundable tax credit which could give $400 to single filers and $800 to joint filers in 2009 and 2010. The bill has also expanded Pell grants to a maximum of $5,350 in 2009 and $5,500 in 2010, hopefully increasing access to a college education to more young adults. And for those of you who are looking to buy their first home, do it in 2009, because you’ll receive up to an $8000 tax credit from the federal government. So what do you think? How will this stimulus bill impact the South Asian community? What do you like about the bill and what do you wish it did/did not include? Nina Baliga joined the National CAPACD staff as the Development and Communications Manager in 2007. Nina develops our communications strategies, and oversees our outreach to members, funders and other stakeholders. Prior to National CAPACD, Nina worked as a Research Analyst for SEIU Local 11, organizing condominium workers in South Florida. In 2004, she worked as the Canvas Director of the Miami office of America Coming Together, where she mobilized tens of thousands of voters in the largest voter contact program in history. She began her political career heading up Florida PIRG’s Clean Water Campaigns. Nina has served on the Board of Directors of SAAVY (South Asian American Voting Youth) as the Fundraising Chair, and mentored SAAVY fellows at the University of Florida as part of a larger South Asian Youth Voter mobilization movement.Nina graduated from New York University with degrees in Sociology and Environmental Studies and recently received her Masters in Business Administration from the University of Florida. After weeks of intense debate and negotiations, Congress passed an economic stimulus package that is headed to President Obama’s desk for his signature today. The final law includes spending for domestic infrastructure projects, funding to state and local governments, and tax relief in the form of cuts and credits. The government knew that it needed to take quick action to pull the economy out of its downward spiral, which has affected everyone’s lives – from immigrants and citizens, to students and seniors, to the wealthy and the working-class. Unfortunately, Congress went the other way on this issue. As part of the stimulus bill, financial institutions receiving funding through the Department of Treasury’s Troubled Assets Relief Program (or TARP) intended to stabilize the financial markets, must jump through extra hoops before they can hire H-1B workers. Given the immense contributions of H-1B workers to help America remain on the cutting-edge, it makes you wonder if this is not only bad news for South Asians, but bad news for the economy. In times of economic crisis, non-profit organizations often see an increase in the need for services. 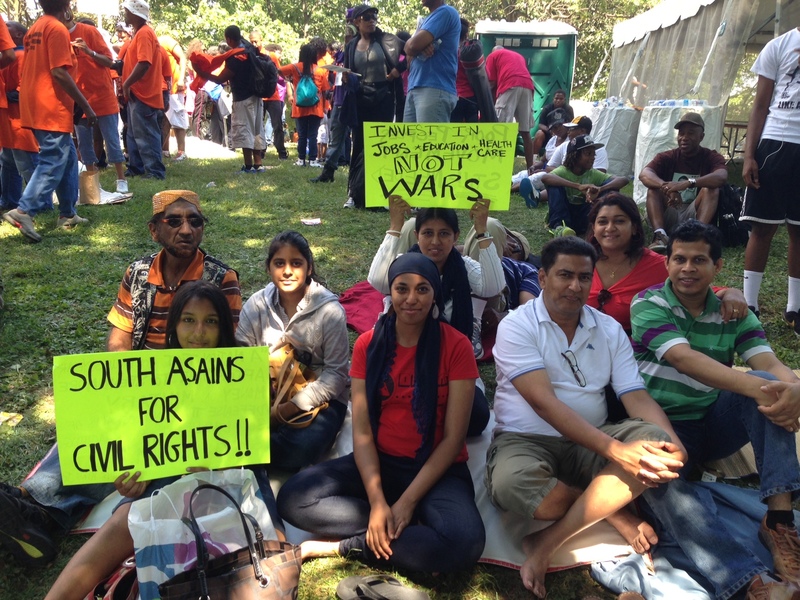 SAALT’s partners who provide services to South Asian community members are observing an increased need for housing, job training, and benefits due to layoffs, lack of jobs, and the downturn in the economy. At the same time, non-profits too are facing the burden of the economic crisis and are having to lay off staff, reduce programming, and dip into reserve funds. As Daniel Gross, a financial editor at Newsweek, pointed out as early as June of 2008, donations from individual donors are down from what they used to be. And with 80 percent of support to non-profits coming from 20 percent of the people in America, any reduction in giving can have a significant impact on non-profit groups. South Asian philanthropy has until recently meant contributing to causes in the home country and to regional and religious associations here in the U.S. As the community matures, accumulates wealth, and increases in number, more South Asian Americans are contributing to institutions in the United States, targeting resources to issues of concern in the community. Strategically utilized, the “brown dollar” can boost the capacity of fledgling organizations that serve the needs of minority communities across the U.S. and can play a critical role in shaping perspectives about South Asians in the broader American community.